to help users better understand if a particular result was relevant for a their search query. Since launch, our Instant Previews team has been keeping an eye on common complaints and problems related to how pages are rendered for Instant Previews. 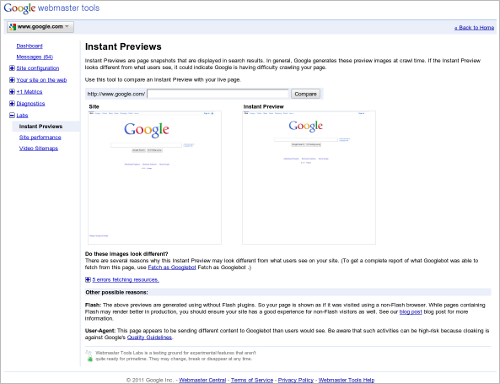 To help webmasters diagnose these problems, we have a new Instant Preview tool in the Labs section of Webmaster Tools (in English only for now). Here, you can input the URL of any page on your site. We will then fetch the page from your site and try to render it both as it would display in Chrome and through our Instant Preview renderer. Please keep in mind that both of these renders are done using a recent build of Webkit which does not include plugins such as Flash or Silverlight, so it's important to consider the value of providing alternative content for these situations. Alternative content can be helpful to search engines, and visitors to your site without the plugin would benefit as well. Below the renders, you’ll also see automated feedback on problems our system can detect such as missing or roboted resources. And, in the future, we plan to add more informative and timely feedback to help improve your Instant Previews! Please direct your questions and feedback to the Webmaster Forum. In November, we launched Instant Previews to help users better understand if a particular result was relevant for a their search query. Since launch, our Instant Previews team has been keeping an eye on common complaints and problems related to how pages are rendered for Instant Previews. 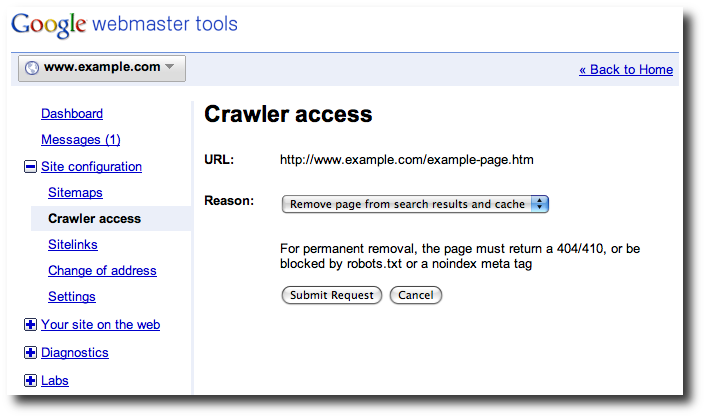 tool in Webmaster Tools to eliminate the requirement that the webpage's URL must first be blocked by a site owner before the page can be removed from Google's search results. Because you've already verified ownership of the site, we can eliminate this requirement to make it easier for you, as the site owner, to remove unwanted pages (e.g. pages accidentally made public) from Google's search results. 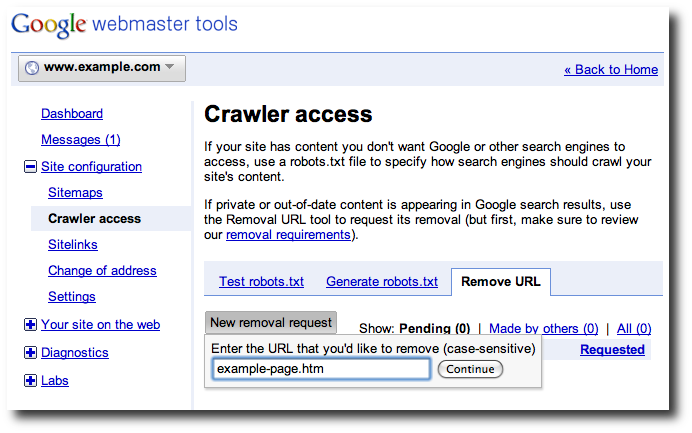 When a page’s URL is requested for removal, the request is temporary and persists for at least 90 days. We may continue to crawl the page during the 90-day period but we will not display it in the search results. You can still revoke the removal request at any time during those 90 days. After the 90-day period, the page can reappear in our search results, assuming you haven’t made any other changes that could impact the page’s availability. 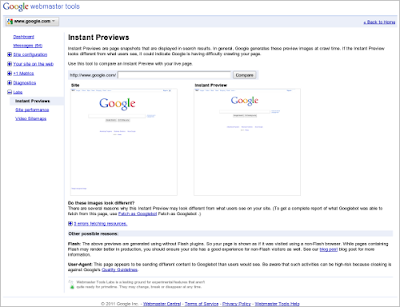 This will ensure that the page is permanently removed from Google's search results for as long as the page is blocked. If at any time in the future you remove the previously implemented page blocking method, we may potentially re-crawl and index the page. 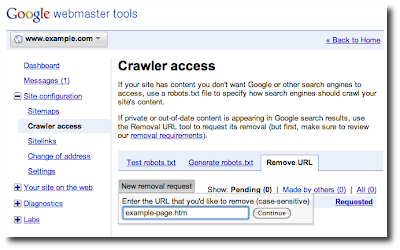 For immediate and permanent removal, you can request that a page be removed using the Remove URL tool and then permanently block the page’s URL before the 90-day expiration of the removal request. For more information about URL removals, see our “URL removal explained” blog series covering this topic. If you still have questions about this change or about URL removal requests in general, please post in our Webmaster Help Forum. 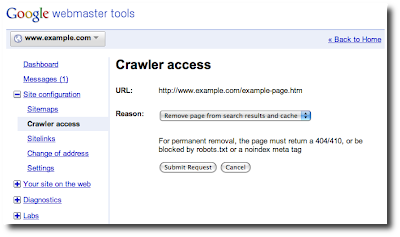 We recently made a change to the Remove URL tool in Webmaster Tools to eliminate the requirement that the webpage's URL must first be blocked by a site owner before the page can be removed from Google's search results. Because you've already verified ownership of the site, we can eliminate this requirement to make it easier for you, as the site owner, to remove unwanted pages (e.g. 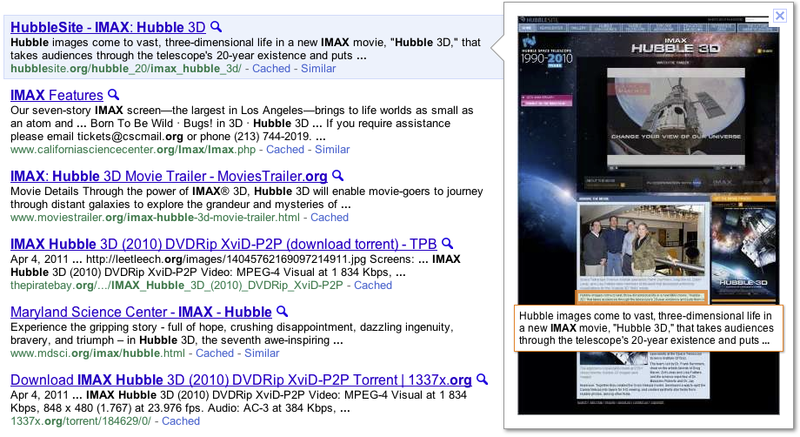 pages accidentally made public) from Google's search results. attacks, cookies stolen with XSS, and websites taken over by hackers due to negligent input validation. Today we’ll show you some examples of how a web application can be exploited so you can learn from them; for this we’ll use Gruyere, an intentionally vulnerable application we use for security training internally, too. Do not probe others’ websites for vulnerabilities without permission as it may be perceived as hacking; but you’re welcome—nay, encouraged—to run tests on Gruyere. You can learn how to find XSS vulnerabilities in your own web app and how to fix them in the second part of Gruyere; or, if you’re an advanced developer, take a look at the automatic escaping features in template systems we blogged about on our Online Security blog. Users are taught to protect themselves from malicious programs by installing sophisticated antivirus software, but often they may also entrust their private information to websites like yours, in which case it’s important to protect their data. It’s also very important to protect your own data; if you have an online store, you don’t want to be robbed. Back in the 1990s, anyone who maintained a website called themselves a “webmaster” regardless of whether they were a designer, developer, author, system administrator, or someone who had just stumbled across GeoCities and created their first web page. As the technologies changed over the years, so did the roles and skills of those managing websites. In contrast to the Google Webmaster Central Team—which mainly focuses on helping webmasters outside of Google understand web search and how things like crawling and indexing affect their sites—our team is responsible for designing, implementing, optimizing and maintaining Google’s corporate pages, informational product pages, landing pages for marketing campaigns, and our error page. Our team also develops internal tools to increase our productivity and help to maintain the thousands of HTML pages that we own. We’re working hard to follow, challenge and evolve best practices and web standards to ensure that all our new pages are produced to the highest quality and provide the best user experience, and we’re constantly evaluating and updating our legacy pages to ensure their deprecated HTML isn’t just left to rot. We want to share our work and experiences with other webmasters, so we recently launched our @GoogleWebTeam account on Twitter to keep our followers updated on the latest news about our projects, web standards, and anything else which may be of interest to other webmasters, web designers and web developers. We’ll be posting here on the Webmaster Central Blog when we want to share anything longer than 140 characters. Before we share more details about our processes and experiences, please let us know if there’s anything you’d like us to specifically cover by leaving a comment here or by tweeting @GoogleWebTeam. 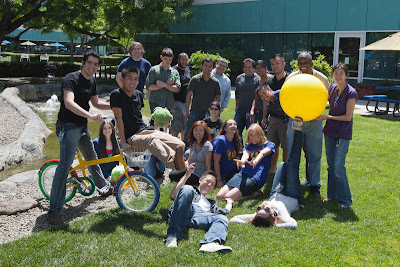 We’re pleased to introduce the Google Webmaster Team as contributors to the Webmaster Central Blog. As the team responsible for tens of thousands of Google’s informational web pages, they’re here to offer tips and advice based on their experiences as hands-on webmasters. A few weeks ago, we introduced Page Speed Online, a web-based performance analysis tool that gives developers optimization suggestions. Almost immediately, developers asked us to make an API available to integrate into other tools and their regression testing suites. We were happy to oblige. Today, as part of Google I/O, we are excited to introduce the Page Speed Online API as part of the Google APIs. With this API, developers now have the ability to integrate performance analysis very simply in their command-line tools and web performance dashboards. We have provided a getting started guide that helps you to get up and running quickly, understand the API, and start monitoring the performance improvements that you make to your web pages. Not only that, in the request, you’ll be able to specify whether you’d like to see mobile or desktop analysis, and also get Page Speed suggestions in one of the 40 languages that we support, giving API access to the vast majority of developers in their native or preferred language. We’re also pleased to share that the WordPress plugin W3 Total Cache now uses the Page Speed Online API to provide Page Speed suggestions to WordPress users, right in the WordPress dashboard. “The Page Speed tool itself provides extremely pointed and valuable insight into performance pitfalls. Providing that tool via an API has allowed me to directly correlate that feedback with actionable solutions that W3 Total Cache provides.” said Frederick Townes, CTO Mashable and W3 Total Cache author. Take the Page Speed Online API for a spin and send us feedback on our mailing list. We’d love to hear your experience integrating the new Page Speed Online API. Andrew Oates is a Software Engineer on the Page Speed Team in Google's Cambridge, Massachusetts office. You can find him in the credits for the Pixar film Up. Richard Rabbat is the Product Management Lead on the "Make the Web Faster" initiative. He has launched Page Speed, mod_pagespeed and WebP. At Google since 2006, Richard works with engineering teams across the world. focused on helping people find high-quality sites in Google’s search results. The “Panda” algorithm change has improved rankings for a large number of high-quality websites, so most of you reading have nothing to be concerned about. However, for the sites that may have been affected by Panda we wanted to provide additional guidance on how Google searches for high-quality sites.